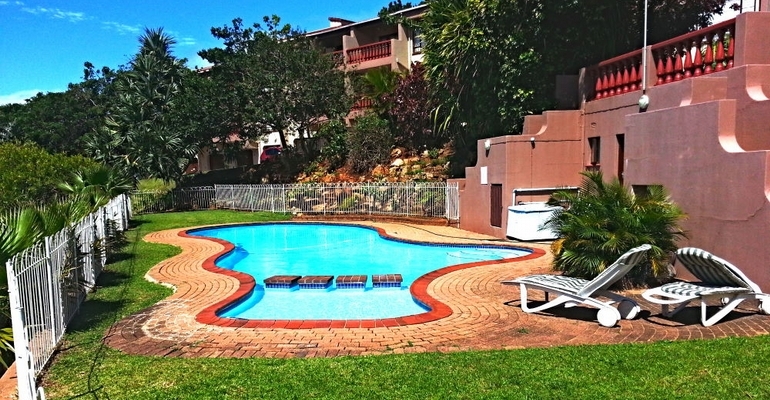 Miramar Cove 33 is a lovely 2 bedroom self catering holiday apartment in a secure complex in Port Edward on the KZN South Coast. The unit sleeps 4 adults and 2 children and is ideal for a family getaway or even just a couple looking for a place to unwind. The unit is an upstairs unit and is well equipped for a self-catering holiday, with a double bed in the en-suite master bedroom and two single beds in the second bedroom. There is also a sleeper couch in the lounge for two additional children. There is a lovely swimming pool on the complex with an attached kiddies section. The kitchen is equipped with all the necessary appliances including a washing machine, and there is a flat screen TV in the lounge with an OpenView decoder (or bring your own DSTV decoder) and a DVD player. The lounge opens onto a balcony which enjoys a pleasant inland view. There is also a braai facility on the balcony. The unit is just a short drive to the main bathing beach in Port Edward and the Wild Coast Sun with its casino, golf course and water park. As the owner of this venue I personally respond to all enquiries. I hate surprises when it comes to my accommodation when I go on holiday, as I am sure a lot of people do, so I promise that the description of my unit and the pictures below are an accurate representation of what you can expect when you stay at Miramar Cove 33. So if you are looking for some clean and comfortable accommodation please contact me on my telephone number listed above, or complete the enquiry form below and I will reply to you as soon as possible. Thank you.